For solo travelers, the traditionally coupled-up cruise world has long meant navigating unfriendly waters, largely due to the dreaded "single supplement." This pesky -- and pricy -- fee could easily double the cost of a cruise vacation for a single cruise traveler looking to sail in a room priced for two. Happily, the tides have turned: More and more cruise lines are coming out with priced-for-one solo cruise cabins on both new and reconfigured ships. These are meant to afford single travelers savings at sea (though, unfortunately, that's not always the case). So what exactly do you get when you sign up for a solo cruise? While solo cruise cabin inventory is still relatively limited today, the concept was virtually nonexistent in the mainstream cruise industry as recently as 2010, when Norwegian Cruise Line stepped in to pioneer a major presence of dedicated solo cabins onboard Norwegian Epic. Today, solo traveler-favorite Norwegian remains at the forefront of the movement with the most solo cruise cabin offerings of any cruise line, spread out across four of its ships. Passengers get design-savvy (if snug) cabins for one -- dubbed "studios" -- as well as the industry-exclusive extra of a shared solo travelers lounge, allowing for easy socializing between solo travelers onboard. Tammy Weiler, President of Singles Travel International, which specializes in booking Norwegian studio cabins, has sung the line's praises, stating that despite the cabins' tight quarters, "the layout is cleverly designed so that the size does not matter." She applauded the solo lounge concept, too, with its "special studio concierge to facilitate a basic agenda for singles." She adds, "They organize a nightly happy hour, make show and specialty dining reservations, and host some Q&A time in the lounge with drinks, coffee and snacks. 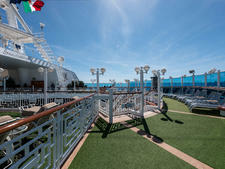 It's an excellent location for meeting other solo cruisers." Costa Cruises and Royal Caribbean International trail Norwegian with big-ship inventory, with Royal Caribbean touting some high-tech touches like "virtual balconies" for interior solo staterooms. Holland America Line followed suit with a dozen designated solo cruise cabins aboard Koningsdam. Cunard, likewise, refurbished all of its ships with solo staterooms. 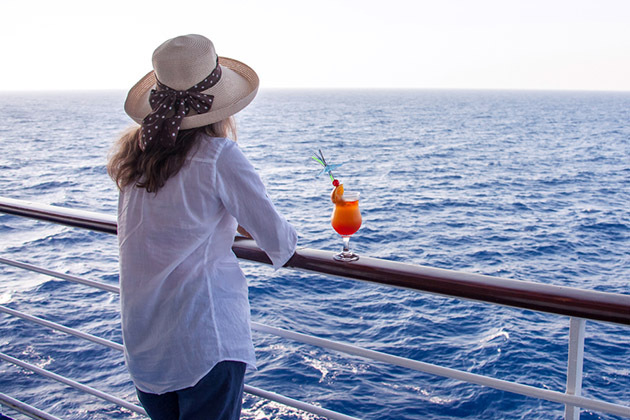 U.K.-based cruise lines have long had a sensibility for solo travelers. Fred. Olsen has featured a generous number of solo cabins across its fleet for nearly three decades, while P&O Cruises also joined the game in 2010, and today offers such units on most of its ships. Overall, booking a solo cabin typically means less room (measuring as little as 100 square feet) and smaller beds. You'll find more single-room inventory for interior cabins than balconies or ocean-view units, though amenities are generally the same shipwide. If you're OK with a little less space, and are indeed saving money (see below), booking a solo cruise cabin is generally a solid choice. And, of course, if you're looking to meet other solo travelers, your chances are upped considerably when traveling aboard a cruise ship that offers multiple cabins for one. However, Eric Kravitz, president of singles-travel specialist Travel Services Worldwide, notes that itinerary options are quite limited if you must book a solo cabin. He said, "Since there are very few ships that offer solo cruise cabins, booking one may only be the best choice for a solo traveler interested in those ships' itineraries. If such itineraries are not appealing, then the best option is often to save even more money by having a roommate assigned as part of a group tour." Are Solo Cruise Cabins a Good Deal? Rates for solo cabins aren't fixed and can fluctuate widely based on season, destination, customer demand and other variables. As this is the case with any cruise room, comparing single cruise room prices to standard cabin prices can be tricky and is best done on a case-by-case basis. A good rule of thumb is that you can generally expect solo cruise cabins to start out priced higher than the per-person rate for a double-occupancy stateroom, but lower than the rate for a single person booking a double-occupancy stateroom, when factoring in the single supplement. Cruise lines offering solo cabins quote fares averaging about 125 to 160 percent more, when compared to the per-passenger rates in shared double-occupancy room. Solo cruise cabins are intended to be a better deal than the single supplement rates for singles booking double-occupancy cabins, which typically average 125 to 200 percent. For example, when we checked, Norwegian listed a sample solo cabin fare in a studio stateroom for a July sailing at $1,099 -- a deal compared to the cost of booking a double-occupancy room with a single supplement at $1,898. However, as solo cruise cabin inventory is quite limited and coveted solo cabins quickly book up on ships, it's not unheard of that the more widely available standard double-occupancy cabins (especially interiors) offer more affordable fares -- even with the added single supplement. Word to the wise: Book early to get your hands on the best solo cruise cabin rates. Cruise travel agents with specialties in booking solo cruise cabins explained why solo cabins aren't always the best deal for single travelers. 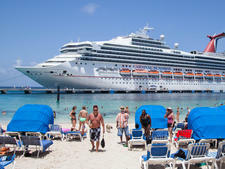 According to Emerson Kirksey Hankamer, president and COO of Vacations To Go (one of the largest cruise-selling companies in the world), in certain cases, "You are better off paying the single supplement on the double-occupancy cabin. The difference between the studio cabin and a standard cabin, plus single supplement, depends on overall demand, which can change for any given sailing." He went on to say, "If double-occupancy cabins are not selling, they will drop the double-occupancy price and the single supplement" -- making a regular cruise room more affordable for solo travelers. 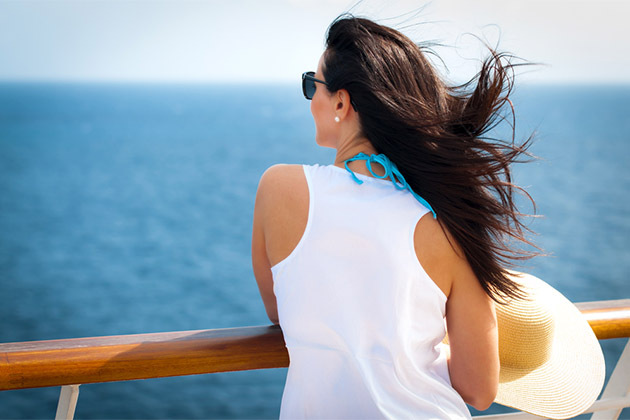 Lindsay Hardy, co-owner of two Travel Leaders agencies in Florida, agreed, explaining that in her experience with booking solo cruise cabins on Norwegian and Royal Caribbean International, "The solo cabin is almost always more expensive than just booking an inside stateroom and paying the additional single supplement fee." According to Hardy, travelers actually pay, on average, 220 percent more to book the solo cruise cabin. While she conceded that certain extras like the shared solo travelers' lounge on Norwegian ships are a bonus, she still didn't think the solo cabin offered particularly good value for her clients. In short, it's smart to consider both solo cruise cabins and double-occupancy cabins with single supplements before booking, especially when considering that single-occupancy cabins can be much smaller in size. Hankamer advised that "prices vary and solo travelers need to do their homework -- or find a travel agent to help them -- to compare both options to get the best deal." And don't overlook the smaller players, like the river cruise lines, which often offer good values on their solo cruise cabin inventory or waived single supplements. Case in point: One of the best values we found for solo cabins was aboard AmaWaterways, where the rates for their solo cabins matched the per-person rate in certain double-occupancy cabins. As for solo cabin cruise deals, don't bother holding out. Hankamer explained, "There are deals to be found, but it's a segment of the market that is not well catered to in today's marketplace. Deals can be scarce." We've "singled" out the major players in the solo cabin cruise market, outlining which lines and ships offer single-occupancy cabins (sometimes called studios), what you'll get when you book them and what kind of value they really offer. Once you find a fit, the expert advice across the board is the same: Space is limited, and solo cabins sell out quickly, so book early or risk missing the boat. 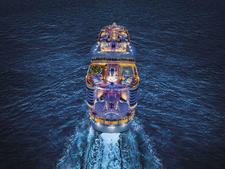 The Ships: Norwegian leads the pack with its cutting-edge offerings for passengers traveling alone. 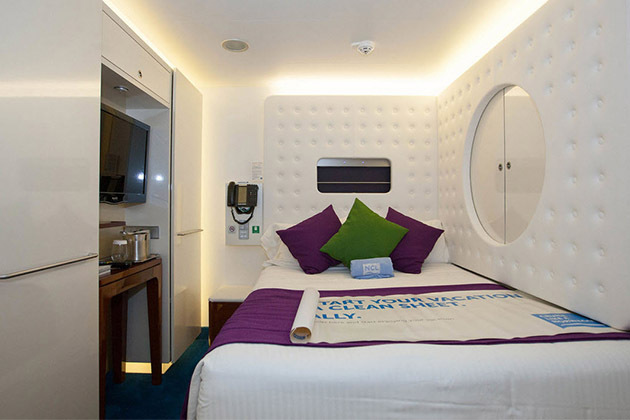 Five of the line's 15 ships tout high-design, single-occupancy "studio" cabins: Norwegian Escape, Norwegian Epic, Norwegian Breakaway, Norwegian Getaway and Pride of America. The Cabins: Norwegian Epic has a generous 128 solo studio cabins onboard, while Norwegian Escape offers 82 studio units. 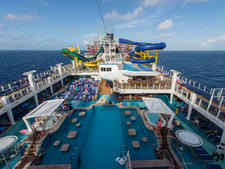 Norwegian Breakaway and Norwegian Getaway offer 59 studio staterooms apiece. Not only does Norwegian boast the most single cabins of any cruise line, but it goes above and beyond in catering to solo passengers with its keycard-access-only Studio Complex (situated on Deck 12 for Breakaway, Getaway and Epic, and Deck 11 for Escape). The area not only clusters the studio staterooms, but also contains a Studio Lounge, an exclusive social hub with a bar and TV area where studio guests can meet up both morning and night to socialize over complimentary coffee and snacks, or via daily hosted happy hour gatherings. Additionally, the Hawaii-based Pride of America has been retrofitted with four similarly designed studio cabins (on Deck 13) and a small Studio Lounge (just a living room with TV, no bar). 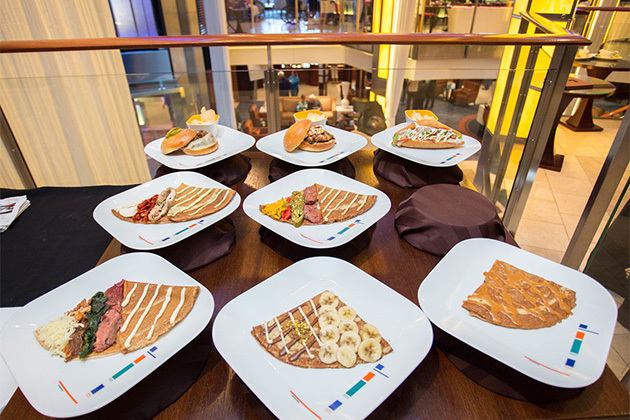 The Ships: Four of Royal Caribbean's nearly two dozen ships -- Quantum of the Seas, Anthem of the Seas, Ovation of the Seas and Harmony of the Seas -- offer solo-traveler staterooms. 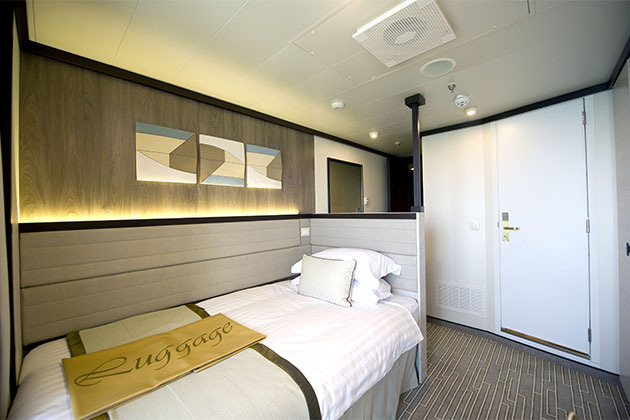 The Cabins: On the line's Quantum-class ships, there are two cabin categories available to solo travelers, both offering standard amenities and European-size double beds. The studio interior staterooms (measuring 101 square feet) boast an industry-first virtual balcony: an 80-inch-high, floor-to-ceiling LED screen that projects real-time views of the ocean and ports. Meanwhile, the studio balcony staterooms (119 square feet) come with a real-deal, 55-square-foot, open-air veranda. (Standard rooms on the same ships would measure about 160 to 180 square feet, for comparison.) Each of the Quantum-class ships has 16 studio interior staterooms and 12 balcony staterooms apiece; these cabins -- located midship and spread out over decks 6 through 13 – can sometimes connect to adjoining staterooms for parties traveling together. Harmony of the Seas offers a handful of studio interior staterooms with virtual balconies, but unlike Quantum-class vessels, the ship does not have any studio balcony staterooms. The Ships: Only two Holland America ships offer single cabins. Koningsdam has 12 dedicated solo cabins with ocean views, and Prinsendam has just three single-occupancy cabins. The Cabins: The dozen solo cruise cabins on Koningsdam are all ocean view (set on Deck 1) and will range in size from 127 to 172 square feet (as compared to 175 to 282 square feet for standard cabins). They feature all of the same amenities of a double-occupancy cabin, but with a single twin bed. On Prinsendam, the trio of solo cabins (two outsides on Deck 9 and one inside on Deck 5) measure 156 to 205 square feet, touting the same size and features of the standard units, but only offering one twin bed and a shower instead of a bathtub. The Ships: Eight ships in Costa's 14-ship fleet feature anywhere from six to 21 solo cruise cabins onboard: Costa Diadema (21 cabins), Costa Fascinosa (17), Costa Favolosa (17), Costa Pacifica (17), Costa Serena (17), Costa Magica (14), Costa Fortuna (14) and Costa neoRomantica (six). The Ships: During a multimillion-dollar refurbishment, Cunard added nine solo staterooms each on Queen Victoria and Queen Elizabeth, as well as 15 ocean-view solo cabins on Queen Mary 2. The Cabins: On Queen Victoria and Queen Elizabeth, solo cruise cabins are located at a prime midship location on Deck 2, close to popular public spaces like the Royal Court Theatre and Queens Room (site of afternoon tea and evening dancing). Choose from eight ocean-view rooms boasting expansive windows, or one inside cabin. On Queen Mary 2, the 15 single staterooms all come with windows. 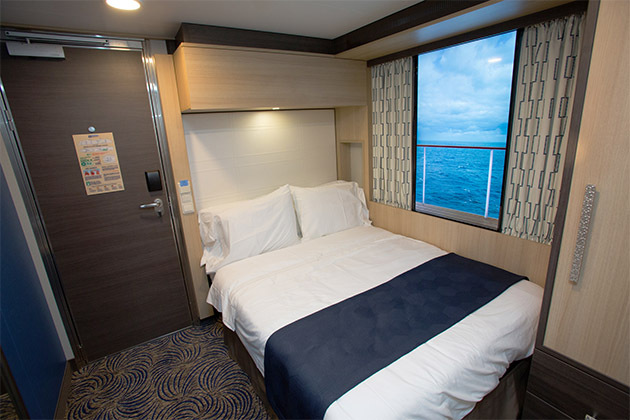 On all three ships, expect wide single beds (measuring close to 4 feet across) and ample storage space (including a wardrobe), with room configurations measuring 159 to 183 square feet -- a good size, considering standard staterooms can run even smaller, from 152 to 243 square feet. The Ships: American Queen has two single inside staterooms and four single outside staterooms with verandas, while American Empress offers one single outside stateroom with a veranda. The Cabins: You'll find American Queen's single inside staterooms (80 square feet) on Deck 5 (the Promenade Deck) and the single outside staterooms (140 square feet) on Deck 3 (the Texas Deck). The latter has a queen-sized bed and a balcony with French doors, and the former has a single bed and no window. The single outside stateroom with veranda on American Empress is a slightly scaled-down version of the ship's deluxe veranda stateroom (at 160 square feet). It offers one twin bed, a private balcony and outside-facing windows. The Cabins: Both inside and outside single cabins measure 125 square feet and have single beds. 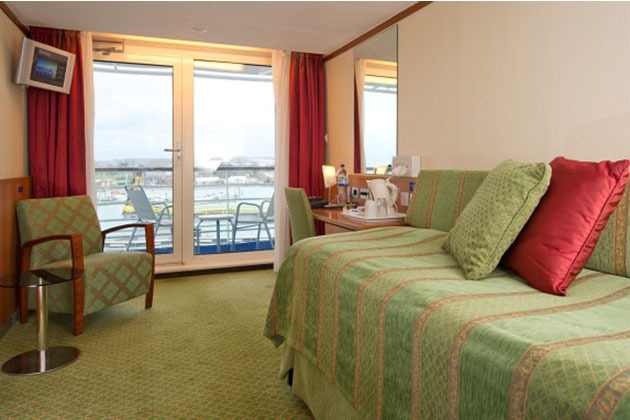 There are also flat-screen TVs, desk and chair, and bathrooms with showers in the one-person staterooms. The Ships: Six vessels in AmaWaterway's 19-ship European riverboat fleet -- AmaVerde, AmaBella, AmaLyra, AmaDolce, AmaDante and AmaCello -- offer one or two single-berth staterooms apiece. The Cabins: AmaLyra, AmaDolce, AmaDante and AmaCello each have two solo cruise cabins trimmed with French balconies, while AmaVerde and AmaBella each have one dedicated solo cabin with a window. Across the board, the 140-square-foot solo cabins offer identical amenities to the more spacious standard cabins onboard (which measure 160 to 170 square feet), but come with just one twin bed. The Ships: U.K.-based Fred. Olsen has offered solo cabins aboard its ships since the line debuted in 1988. Today, the units are available fleetwide on all four ships: Braemar, Black Watch, Boudicca and Balmoral. The Cabins: Fred. Olsen has allotted 190 solo cabins across its fleet, which are sprinkled across the decks of the individual ships and cover a variety of cabin categories, including inside (measuring 130 to 140 square feet, versus 140 to 160 square feet in standard cabins), outside (140 to 150 square feet, which is the same in standards) and balcony suites (140 to 200 square feet, versus 165 to 200 square feet in standards). Braemar offers 40 single-occupancy cabins, Balmoral has 64, and Black Watch and Boudicca each have 43. All units come with amenities that are standard across the fleet, with the only difference being that they contain just one oversized single bed (measuring 6-by-4 feet on most ships). What Ships: British line P&O Cruises offers single cabins on six of its seven vessels, including Azura, Arcadia, Aurora, Britannia, Oriana and Ventura. The Cabins: P&O's solo cruise cabin configurations vary by ship, but all come with oversized single beds and standard amenities (though they only offer showers, with no option for tubs). Britannia has the most dedicated single-occupancy cabins in the fleet, with 15 solo balcony cabins (164 square feet, including the balcony) and 12 solo inside cabins (134 square feet), which come spread out across the Lido Deck (Deck 16). Azura was the first of the line's new-build vessels to debut with single cabins back in 2010; it offers 18 single cabins (both on Deck 6), including 12 outside cabins and 6 inside cabins, all measuring 130 square feet. Retrofitted sister ship Ventura offers the same. Arcadia was retrofitted in 2013 to offer two solo balcony cabins (206 square feet) and four solo inside cabins (189 square feet) on Deck 10. Aurora was likewise retrofitted and features four outside solo cabins (150 square feet) on decks 9 and 11; Oriana was retrofitted to have two inside solo cabins (118 square feet) on Deck 8. Overall, P&O's solo cruise cabins range in size from 118 to 206 square feet, which is a generous size considering that standard cabins measure just a wee bit larger, from 137 to 237 square feet.